The basis of any bet, either with your friend or with a bookmaker at the betting outlet, is the probability. Consciously or subconsciously you will always put a probability to the predicted outcome. In the betting industry, the probability of any outcome is mirrored in betting odds. The probability is the key to the betting decision process. The successful tipsters are trying to bet when they see the probability of the outcome higher than the bookmaker. That is the simple first rule you should stick to. In our imaginary scenario, the betting odds for the above-mentioned match should be 3.0 – 3.0 – 3.0. However, that would happen just in the ideal world. In the real world, you will probably get odds 2.9 – 2.9 – 2.9. That would mean that bookmaker see the probability of every outcome at 34.48% and the sum of probabilities is 103.44%. 3.44% is the margin of the bookmaker. In case that bookmaker will take the same amount of bets at every possible outcome, he will earn 3.44% of the sum bet on the match, no matter what the result will be. 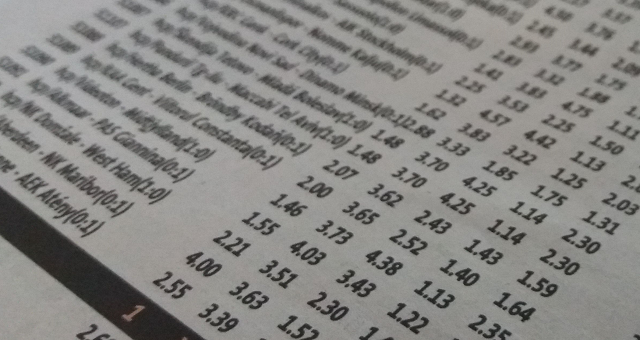 The margins of bookmakers differ depending on the sport and the exact match. Generally, the bigger favorite in the match is, the higher margin will be included in odds. I do not see the margin as absolutely unfair (of course it depends on how high it is), as bookmakers need to cover their costs and provide also a lot of additional services (statistics, live scores, etc.). The fair odds are available just in case you are making a bet with your friend. Betting exchanges also tend to provide fair odds as they are ruled by supply and demand. But do not forget, that you will pay a commission from net winnings to the exchange, that impact the net odds you are able to realize.